Whether you call it fake news, alternative facts or something else, pervasive misinformation and need for more careful examination and verification of information today is a hot topic. Despite the bright spotlight being shined on “information literacy” (a phrase coined in the 1970s), however, it is not a new area of discussion especially for libraries. Libraries and librarians are regularly called upon to step up when privacy, free speech, or access to information appears to be compromised, and today’s current climate and the prevalence of misinformation is no exception. Information literacy is a far more complex subject than it was in the past, however, before the Internet and social media made a whole world of information and misinformation available at our fingertips. It is a dynamic and unpredictable topic area. And it is no easy task to keep up with the volume of information now being disseminated on this topic, much less curate and recommend the best of what is out there. We’ve listed below a few tools to help people get started identifying and combating misinformation. We’ve also listed a few articles we liked that describe and define the vital role libraries play in information literacy. The resources listed below are drawn from our collection, from other public and academic libraries, and from our colleagues in journalism and science. 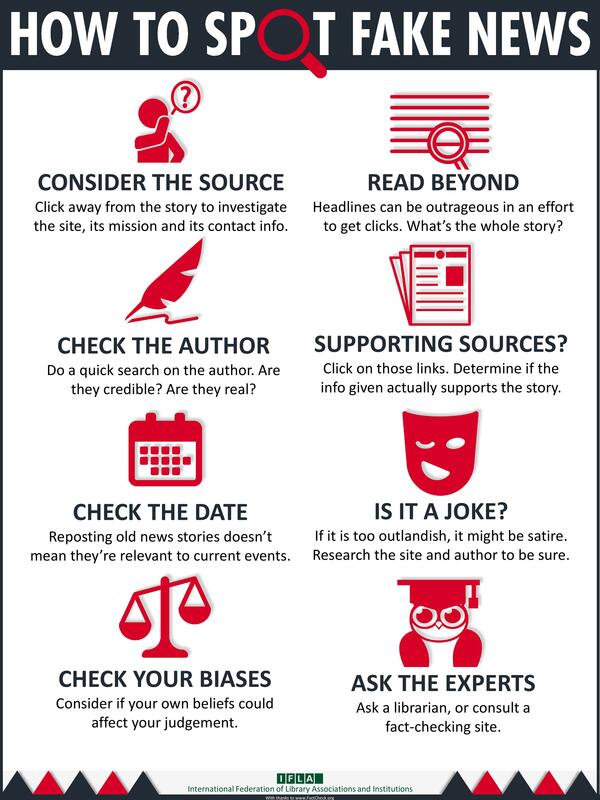 The International Federation of Library Associations and Institutions (IFLA) has made this infographic available with eight simple steps based on FactCheck.org’s article How to Spot Fake News. IFLA invites anyone to download, print, translate and share this infographic, stating “The more we crowdsource our wisdom, the wiser the world becomes.” The infographic is published under CC BY 4.0. Also check out FactCheck.org’s video, also based on the article. Check out our curated list of items in our collection that examine information literacy, the role of access to information in our democracy, critical thinking in the Information Age, and more! We’ll take this opportunity again to highlight our core values by linking to statements we’ve published during the past year. And while we think it is important to write down our values and share them, we also live them every single day when we open our doors and welcome everyone in. Have questions or suggestions? Ask us!